Advantages of Turbine in engineering are countless especially comparing with a reciprocating engine. So, Let’s start with the definition of the steam turbine by Graham “The turbine is a prime mover in which a rotary motion is obtained by centrifugal force brought into action by changing the direction of a jet a fluid escaping from a nozzle at high velocity”. The turbine is an ideal prime mover and has got a variety of uses. It is used for driving electric generators and ship propellers in large size and in a smaller size. It is adaptable for driving pumps, fans, and Air Compressors etc. The steam turbine is well adapted for work which requires high rotation and constant speeds even with widely fluctuating loads. Hence I will like to share advantages of the steam turbine over a reciprocating engine with you. Hope you like it. 01) There are some frictional losses in a reciprocating engine as some arrangements are required for conversion of reciprocating motion into circular motion. But in a steam turbine, no friction losses are there because of no moving parts. 02) The steam turbine develops power at a uniform rate and hence does not required flywheel. Whereas the flywheel is a very big and heavy part of a reciprocating engine. 03) Lubrication is required for internal rotating parts in an engine. In the case of a steam turbine, no internal lubrication is required as there are no rubbing parts inside. 04) Much higher speed may be developed and a far greater range of speed is possible by steam turbine than the case of a reciprocating engine. 05) If the steam turbine is properly designed and constructed then it is the most durable prime mover. 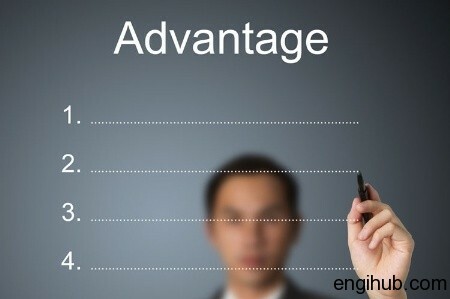 This is the most important advantages. 06) No heavy foundation is required for turbine because of the perfect balancing of the different parts. Whereas the foundation is must for a reciprocating engine. 07) The thermal efficiency of a steam turbine is higher than that of a reciprocating engine. 08) A steam turbine is quite suitable for the large thermal power plant as they can be built in size from few horsepowers to over 200000 HP in a single unit. Engine: How to Compound Steam Engines?